Reminded Ha Long, all people may think to Ha Long Bay first because of the incredible natural landscape as a wonder of the world. In the guide book of Vietnam Tourism, you may know more about 2 words of Ha Long by its position in Quang Ninh province which is the large province in the North of Vietnam. Ha Long firstly is the center city of Quang Ninh province. It is also the tourist city attached with well-known Ha Long Bay. Ha Long City has the long beach. It is bordered with Ha Noi Capital and Hai Phong to the West and East Sea to the South. Wards: There are 20 wards in Ha Long City in which have some important wards such as Hong Gai, Bai Chay, Hong Ha, Ha Khau, Hung Thang, Tuan Chau etc. Tourist places: Bai Chay Ward, Hung Thang Ward and Tuan Chau Ward. 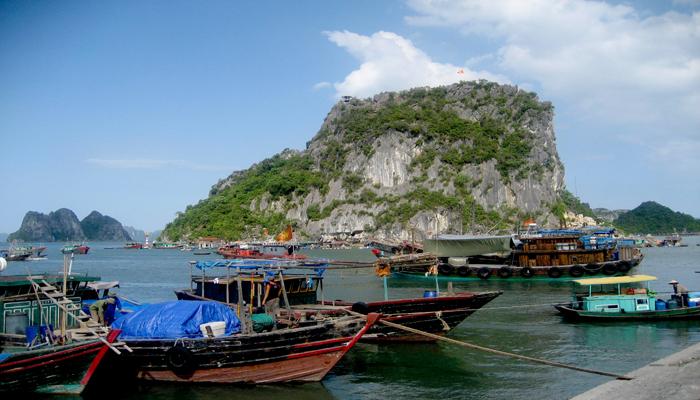 Climate: Ha Long City is in the coastal climate region. You can find here two seasons in the year. They are winter time from November to April and the summer time from May to October. It is rain in the summer time. The best time for travelling in Ha Long is in the winter time. It means in the dry time with limit of the rainfall. Transportation: Travel conveniently by land to the town and from it to other places. Ha Long Bay: this is the wonder of the world recognized by UNESCO. There are many small stone islets in the bay that make the excitement for this place. There are different routes by boat or cruise for exploring the bay interestingly. Bai Tho Mountain: located on the seaside of Ha Long city. The mountain is the fantastic view with the ancient writing of the poem of Le Thanh Tong – a king in the Le Time in 15th century. The poem was carved on the mountain and it has been existed still now. Long Tien Pagoda: the pagoda is located in the Bai Tho Mountain on the foothills. It is called the center of Buddhist center of the city. Hon Gai Church: the church is the wonderful architecture that located in Bach Dang Street in Ha Long City. It is not far from the center of the city. Quang Ninh Museum: If you love to understand about the history of Ha Long City and Quang Ninh Province, Quang Ninh Museum is the place you should come. The museum is located in Nguyen van Cu Street in Ha Long City. Ha Long Trade Center: the wonderful place for shopping and enjoy the business life of local people. Ha Long Trade Center is located in the center of the city, so it is easy for you to come to visit or go shopping. Tuan Chau Island: this is the tourist zone of the city. Tuan Chau Island is located far from Ha Long Center some kilometers. It is considered the tourist complex with restaurant, the beach, resort and hotel, and amusement park etc. Hoang Gia International Park: or called Royal International Park. It is located along Bai Chay Beach nearly the center of the city. You can find here the restaurants, the hotels, the flower garden, service center for water sports, water Puppet show etc. And there are other destinations for visiting in the city. Long Tien Pagoda Festival: the festival is organized in March of the lunar time in the area of Bai Tho Mountain. Ba Men Temple Festival: the festival is happened in the spring in Ha Long Bay. This is considered the unique festival of local fishmen. Cherry Blossom Festival: the event to emphasize the friendly relationship between Quang Ninh Province and Japan. It becomes the annual big event recent years. The event is organized in the spring time in the center of Ha Long City. Carnaval Ha Long: the big event in Ha Long City for tourism. The event is happened each year to contribute to the tourism of the province. Ha Long is the beach city so the first specialty in here assuredly seafood. There are some typical specialties in the city that you may try to taste such as fried chopped squid, local bread, local chicken, dried shrimp peeled and many other local specialties.